Three exhibitions prompt this question: “Dal�” at the Philadelphia Museum of Art (to May 15), “Max Ernst: A Retrospective” at the Metropolitan Museum of Art (1000 Fifth Avenue, to July 10) and “Surrealism USA” at the National Academy of Design (1083 Fifth Avenue, to May 8). I would not accuse the Metropolitan and certainly not the National Academy of Art (see below) of pandering to the public in pursuit of box-office bucks. And one should never wave a cautionary finger at the Philadelphia Museum of Art just because it has instigated or attempted to instigate one annual, crowd-pleasing blockbuster after another. Museums are expensive to run. Blockbusters bring in new members and sorely needed cash, or so it is claimed. It depends on accounting. Nevertheless, one wonders why there’s this sudden interest in Surrealism, that most academically despised branch of modernism? Could we have run out of Impressionism and Post-Impressionism packaging ideas? “Manet, Monet and the Caf�”? “C�zanne vs. C�zanne”? Or is it just that the safe modernist masters are now just too costly to ship and insure? I am afraid to say that by all accounts the Salvador Dal� show at the Philadelphia Museum of Art has proved a success. The Max Ernst is not packing them in, and neither is “Surrealism USA,” although in the latter venue, even a handful of people on a Tuesday afternoon is probably a plus. “Dal�” also has the virtue of inspiring full-service gift-shop offerings, whereas “Max Ernst” inspires: books about Ernst and maybe an excellent book of poems by his wife Dorothea Tanning. Ernst’s paintings are really too creepy to inspire note cards, pillows, sofas, paperweights, key chains, ties, scarves, potholders, shopping bags, place mats, telephones, et al. You could get away selling lobster-flavored macaroni in honor of Dal�’s lobster telephone, but it would be hard to get away with selling nightingale-flavored macaroni in honor of Ernst’s much more surreal Two Children Are Threatened by a Nightingale (1924). When I went to see the Dal� show a few weeks ago, the Philadelphia Museum of Art was jammed, booked solid on a Saturday. You had to have reservations, but even so there were too many people. Those audio tours make people cluster around certain paintings. I looked at eyes. Most people were listening, not looking, which was just as well. The paintings – even the early ones that I was prepared to like – have not worn very well. Dal�’s crowd-pleasing photo-Surrealism so influenced bad illustration that his works now look even worse than the commercial art he influenced. Although I still think the PMA’s Soft Construction with Boiled Beans (Premonitions of War), 1936, is one of his best works, in general I enjoyed the gift shop offerings more than the paintings. That’s it! Dal� was the best commercial artist of his time. I prefer his Mae West lips sofa to his soft watch and his stage sets to his paintings of imaginary stage sets. I prefer his film collaborations with Luis Bu�uel and his sequence for Hitchcock’s Spellbound to his ghastly variations on the pseudo-theme of William Tell. His shenanigans were better than his paintings: throwing himself though the window of a department store was more important than the paintings he left. We love the blather of his autobiography and, of course, his mustache. He may have been the first artist to try to use media as an art form, but since the media used him to confirm middle-class definitions of the nutty artist, his fate in art history should be a lesson to all new art-world superstars. All the world loves a clown, for about 10 seconds. But Dal� is great. Dal� is liberating. Dal� is endlessly fascinating. Dal� is a good antidote to Impressionism, to Cubism, to Abstract Expressionism … if you are 14. I have nothing against being 14. I loved Dal� when I was 14. There is a part of me, thank goodness, that is still 14. But when I look at Dal� now I think: Why did anyone ever think that someone who was pro-Franco could be taken seriously? And his latter-day mixtures of Catholicism and physics? Let’s not even bother with that. The Surrealists who were in bed with the Soviet Communists at least knew enough to move from Stalin to Trotsky and then out. Their hearts were in the right places; it’s just their brains that were wrong, for awhile. Dal� had a dollar sign for a heart, and as the paintings prove over and over again, not much of a brain. Was Jackson Pollock a Surrealist? 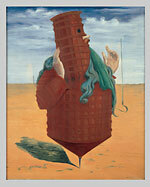 The three exhibitions currently on view bring up anew the question of Surrealism’s validity. Limited formalism, now long past, promoted the idea that Surrealism was primarily literary. Since according to these lights the arts were best when separate and ideally self-referring, Surrealism was not sufficiently modern. Even MoMA modernism didn’t buy that. Too many collectors would have had to throw out their Ernst errors, their Dal� dalliances, their Magritte mistakes. But we shouldn’t complain too loudly. Some Surrealism, no matter how flawed, is better than none. At least we are reminded that you may take Surrealism out of modernism, but it just won’t go away. Why? There simply no better way to express, or at least emblemize, anger and fear. A variant of MoMA modernism, apparently the invention of curator William Rubin, held that there were two kinds of Surrealisms: illusionistic and abstract. The abstract form was fine since it could be shown that Mir� and Masson were the probable sources of a certain splashiness that came to be favored in New York art. At the Metropolitan, we could look now to a specific painting by the otherwise questionable Max Ernst — who, like his illustrious predecessor Georgio de Chirico, was generally more on the side of poetry than form — for further confirmation of how clever Jackson Pollock was at appropriation. 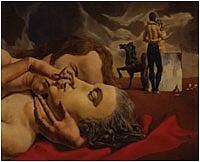 The specific work is Surrealism in Painting, 1938. In it, a canvas is being painted by one of Ernst’s strangest of creatures (a kind of polymorphous blob), but what is important, as pointed out by the adjacent wall text, is that the painting-within-the-painting was created by what the artist himself called “oscillation.” After pouring paint into a can with a hole punched in its bottom, he swung the can from a string, creating flung lines. 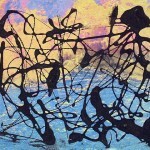 Pollock saw this painting in 1942. But we could also look to a 1941 three-way collaboration now revealed for the first time by “Surrealism U.S.A.” William Baziotes had the idea of dripping and throwing white paint on a small canvas, and Pollock and Gerome Kamrowski joined in. It’s a gem. Kamrowski’s 1945 Part I — The Great Invisibles, by the way, is also worth looking at. Are there more where these came from? Knud Merrild, with his “flux” paintings, is another discovery: paint poured on a surface and then manipulated without a brush. But there is also that famous Navajo sand-painting demonstration at the Museum of Modern Art that Pollock certainly must have heard about. And then there is that late-starter Janet Sobel, who, coming out of nowhere at the age of 52, showed dripped and splashed paintings at Peggy Guggenheim’s The Art of this Century in 1946. Clement Greenberg, Pollock’s promoter, says that Pollock knew her work. The Dal� exhibition is predictably abysmal, and the Ernst is predictably marvelous. “The marvelous” is a technical term within the annals of Surrealism, meaning something like glorious, weird, never-before-seen, fabulous (as in fable). A waking dream. Something that unifies the conscious and the unconscious. Ernst started in Dada and then was the most adventurous of the surrealists. Even hisoften criticized American paintings have moments of great terror and joy. 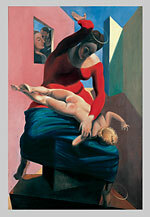 Although there are some antireligious paintings (The Blessed Virgin Chastises the Infant Jesus Before Three Witnesses, 1926) and one or two anti-Fascist ones, it will not do to try to see personal expression in Ernst’s artworks and then, of course, to bemoan its lack. That is not what Surrealism was about. 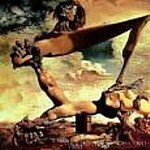 You might be able to read into the paintings your own personal feelings, but Surrealism was an attempt to be objective. “Surrealism USA” at the National Academy — in spite of mylar in the hallway, dress-shop dummies, and the Duchampian string installation in the last room — is refreshing. It is at long last a serious exhibition at this weird, but historically interesting, venue. I take it back; the recent Edwin Dickinson show was also serious. But in terms of the current survey, all of these almost-interesting American Surrealist paintings needed to be flushed out, once and for all. The exhibition shows why we really needed Abstract Expressionism. And fast. Sometimes the bad guys, meaning the formalists, were right. Or half right. Or right for the wrong reasons. American versions of representational Surrealism was inconsequential or barely worth saving. I, of course, would buy any work like this I found at a yard sale. It is all very interesting historically, if not artistically. But Peter Blume and Louis Gugliemi? One can agree with their left-wing politics without approving of their paintings. The Los Angeles Post-Surrealists? Helen Lundeberg’s Double Portrait of the Artist in Time from 1935, which one may have been intrigued by when represented by a reproduction in an art-book survey, here pales when placed in the context of other Post-Surrealist efforts. Even Adolph Gottlieb’s 1939 Picnic is weak. American Surrealism, as catalogued here, is boring not because it is representational or because it aped a far grander original, but because it was mawkish; because it offered fantasy rather than the fantastic; because, alas, it was illustration and not revelation. When I was thinking about Surrealism and whether or not I should write something, I had a dream. Wearing my poet’s hat (no two sides of which are alike), I was being interviewed. The Interviewer, who was unknown to me, asked, “Has Surrealism influenced you as a poet?” He must have known that a few of my poems were once published in an anthology of British and American Surrealism. Even in the dream, I pondered the meaning of this answer. What was that one idea? Interviewer: So you are interest in Surrealism as mediumship? JP: No, I am interested in poetry as mediumship. But I interrupt myself because the dream of a few nights ago started up again. Interviewer: You said you were interested in Surrealism’s one idea. What is that idea? JP: That it is possible to create other realities.